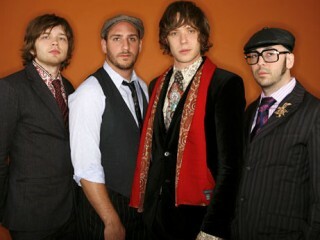 OK Go is an alternative rock band originally from Chicago, Illinois, USA, now residing in Los Angeles, California, USA. 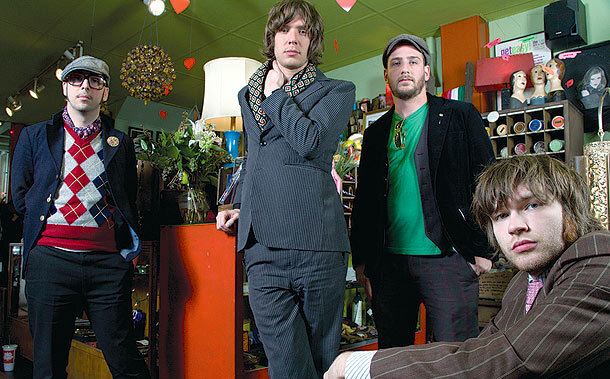 The band is composed of Damian Kulash (lead vocals and guitar), Tim Nordwind (bass guitar and vocals), Dan Konopka (drums and percussion) and Andy Ross (guitar, keyboards and vocals), who joined them in 2005, replacing Andy Duncan. They are perhaps best known for their often elaborate and quirky music videos. OK Go didn't find an audience until 2005, when the band began creating homemade music videos to support their combination of off-kilter guitars, Pixies/Cars fetishism, and straightforward power pop sensibilities. Recognizing the growing popularity of websites like YouTube, the group shot a campy dance video for "A Million Ways," a song from their sophomore album Oh No. It quickly became the most downloaded music video in history, and OK Go won a Grammy Award for their follow-up subsequent video -- this one featuring the bandmates dancing on treadmills -- while continuing to produce clever, melodic pop music. When the combo returned in August 2005 to issue the sophomore effort Oh No, it was without guitarist Duncan, who'd left after sessions for the album had ended. His replacement was Andy Ross, who joined the band in creating a pair of ingenious, low-budget videos. The clip for "A Million Ways" featured the bandmates practicing complicated dance steps in someone's backyard; consisting of one long take, it spawned countless fan tributes online and helped make the actual song a hit in Europe. Several months later, the popular "Here It Goes Again" found OK Go dancing once again -- this time on a series of moving treadmills -- and the song became a Top 40 hit in America and the U.K.
OK Go took home a Grammy Award for the latter video and eventually returned to the recording studio, where they created an EP, 2008's You're Not Alone. The album Of the Blue Colour of the Sky followed in 2010 and cracked the Top 40, thanks in part to singles like "This Too Shall Pass" and “End Love.” The group toured heavily in support of the album, logging 180 shows in 2010 alone. Some of the shows were recorded, and the resulting footage was released the following year as 180/365, a live album featuring mixing from Dave Fridmann. 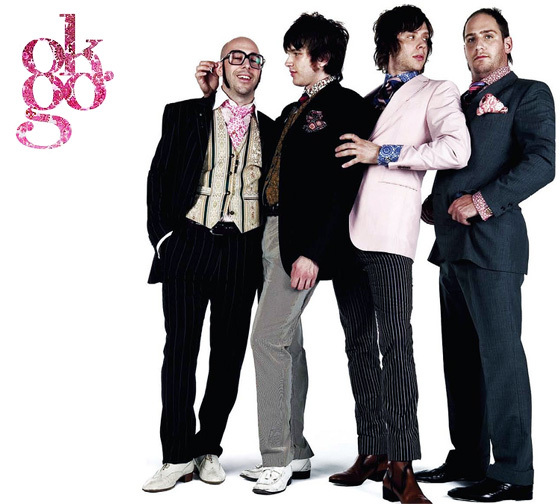 OK Go has earned considerable fame for their creative but often low-budget music videos, most of which have been promoted through Internet video sharing sites like YouTube. Many of these have become viral videos; the 2006 video for "Here It Goes Again", in which the band performed a complex routine with the aid of motorized treadmills, has received over 50 million views four years later. Their newest music video, Needing/Getting, released February 5th, 2012, already has 17 million hits on YouTube and is part of a Chevy Sonic commercial. Samuel Bayer, who produced many music videos in the 1990s, asserted that OK Go's promotion of music videos on the Internet was akin to Nirvana's ushering in the grunge movement. Many of the videos also use long or single-shot takes, which Salon's Matt Zoller Seitz claims "restore[s] a sense of wonder to the musical number by letting the performers' humanity shine through and allowing them to do their thing with a minimum of filmmaking interference". The success of OK Go's music first won the band the 14th Annual Webby Special Achievement Award for Film and Video Artist of the Year. The video for "This Too Shall Pass" was named both "Video of the Year" and "Best Rock Video" at the 3rd annual UK Music Video Awards. "This Too Shall Pass" won the LA Film Fest's Audience Award for Best Music Video, UK MVA Awards – Music Video of the Year Winner 2010, among others.